On March 21, 1995 I ordered my Jeep Wrangler YJ from a local Jeep Dealer. With little money, I was limited to what I could get on it. It is Emerald Green exterior and Spice Interior, with a Spice Soft Top, 2.5 engine and a 5 speed transmission. I ordered the "S" Package #23B. This was optional equipment with Rear Bumperettes, Floor Carpeting (I took out 2 days after receiving the Jeep), Right Outside Mirror, Front Reclining Seats, Rear Seat (gone with the carpeting), Convenience Group, Floor Center Console, Courtesy Lights (unplugged)/Glove Box Lock (useless) and Intermittent Wipers. No Radio. I ordered Full face wheels with P215 tires instead of the P205(Standard). All this for $14,366.00. The Jeep without the S Package was $11,995.00. On April 28, 1995 I drove the new Jeep off the lot with 8 mile on it. On July 4, 2008 driving down the Highway with 206,568 miles on it, I experienced "internal engine failure"! The Jeep sat in my driveway until March 23, 2009, when it was towed away to have the engine rebuilt. On April 7, 2009 the Jeep was ready to roll again, only now it needs a 5th gear. I drive it but only keep it under 40 mile an hour. The Clutch was original and was replaced at the same time the engine was. The oil was changed every 4000 miles like clock-work, and the front and rear differential oil was changed every 1500 miles. The same for the transfer case. Although it's hard to get in four wheel High, it goes in 4 wheel Low easy and then into 4 High. But I can't go from 2w/d to 4w high. I have to go to 4w Low first. It leaks water though the cowl. Its had 2 stereos, a new top and a window in 2004.
sold after his death in 1954. I didn't come long until 1956. I would have loved that Jeep and took great care of it for him. I used to wheel with three other guys, who had a Black 1983 CJ5, 1974 Red CJ5 and 1995 Black YJ. The YJ was purchased after mine and it had a lot of TJ parts on it. It used a different Serpentine belt, and on the hood where most Jeeps have U shaped things to hold the window when it is down, this one had the round rubber things that the TJs have. Today my Jeep sits a lot, waiting for me to get money to replace the 5th gear. But I do drive it on weekends. I drive a 2001 Cherokee during the week. I really love it, but its not my CJ2A. I would drive the 2A and then get into the YJ and it would be like driving a Cadillac. I regret getting rid of my CJ2A, but I love my YJ. When they first came out I said I would never buy a Jeep again, but I couldn't live without one. The 2A was too slow to drive on the highway. So I had to get something I would love to drive and feel safe in. I feel safer in a Jeep (CJ, YJ, TJ or JK) more than any other vehicle. I think YJ's are as good as any Jeep made after 1947. Well that's the story of my YJ. With the new engine I hope to get another 207,000 from it. Good luck with your Jeep, or if you're planning on getting one, good luck finding the right one. Remember, "you always wanted one" now do it. Larry's Comment: Man! You got some service out of that '95 YJ Mike. Glad to hear that you are fixing it up and planning on keeping it for a long time. It'll be a "classic" in about 5 years. 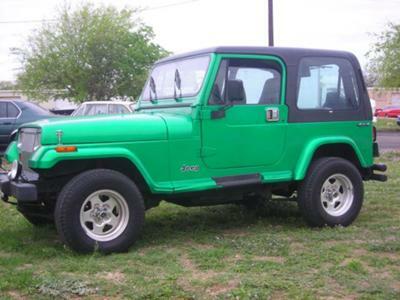 Also, we sure would like to see a good photo of the green YJ if you have one.